I’m currently one episode from the end of the fourth season of Breaking Bad, which has morphed from being one of the smartest shows on television into a thing of almost Dostoefskyan bleakness. Because many viewers here in Australia are only beginning to watch Seasons 3 and 4 I’m going to avoid any specifics about either season (there’s one vague, non-specific spoiler ahead for people who haven’t seen Season 3 yet), but I wanted to make a couple of observations about the show. The first is how incredibly impressive the show is on a whole range of levels. Quite aside from amazing performances from its two leads (Aaron Paul’s depiction of Jesse’s disintegration is brilliantly observed) I’m consistently fascinated by its use of light, and by the way it employs the physical location in New Mexico. Season 4 makes increasing use of time-lapse montages, some of which are incredibly beautiful, but the show uses time, and scenery to give texture to the moral disintegration at its core in a whole series of fascinating ways. This use of space and time is also very effective at underlining both the euphoria and the yuckiness of the drug culture at the show’s core. There’s a constant slight sense of displacement and irreality, which brilliantly mimics the distortions of time that come with speed and other mind-altering subjects. More interesting to me though is the way the show is prepared to push against the conventions of television shows by presenting a character who is essentially beyond redemption. As anybody who’s seen the final episode of Season 3 will know, there is a moment there when Walt – and to a lesser extent Jessie – cross a line they cannot return from, and which makes Walt, in his own way, no different from Gus or the cartels. This isn’t the sort of action that’s often explored on television, partly because it makes of extremely troubling viewing, partly because the ongoing nature of television largely precludes damaging or compromising central characters beyond repair. Yet the writers and producers have elected to go there, and the result is, if not easy viewing then certainly compelling and often challenging viewing. But it also points to what I think is one of the really interesting things about the show in general and Walt in particular. As becomes more and more clear as the show goes on, the problem for Walt and Walt’s life isn’t cancer, or Jessie or Gus, but Walt himself. 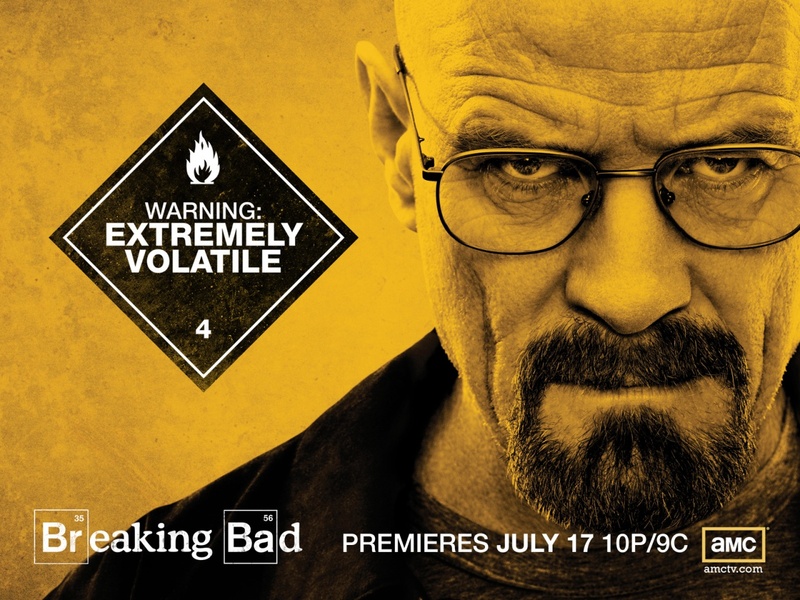 Walt’s anger, his resentment that the world has not given him what he believes is his due infects everything he does. But more potently, as becomes very clear in Season 4, he is not a man who consistently makes bad decision despite his intelligence, but because of his intelligence. Time and again he makes decisions convinced he has calculated the odds, that he has out-thought and outsmarted everybody around him, and time and again he is wrong. This aspect of Walt’s personality is captured brilliantly in Bryan Cranston’s performance, which constantly refuses the sort of grandiosity that would normally be associated with the fall of a character like Walt: certainly we’re never allowed to believe there’s anything Shakespearean about Walt, instead we’re constantly reminded of what a crabbed, angry, unpleasant man he has become once his inner self is released. And while once again it doesn’t make for easy viewing, it’s disarmingly complex precisely because it refuses to romanticise Walt’s failings. What’s also interesting is how rarely characters like Walt appear on screen. Or, to put it more precisely, how often characters like Walt are depicted so realistically on screen. Because in fact television is full of characters like Walt. Any David Simon show has half a dozen of them: angry, difficult, toxic A-type male characters, many of whom seem to be versions of Simon himself. Yet in Simon’s hands (and indeed most places) they present as loveable rogues, hopeless pussyhounds whose drinking and contrariness and general impossibility only make them more admirable (and more irresistible to women). So why don’t we see more characters like Walt on screen? Part of the answer is obviously that they’re not a lot of fun to be around. But I do wonder whether there isn’t another answer, something to do with the sort of A-type personality that fills television story rooms, and its general resistance to critiquing itself. Because let’s face it, The Wire’s Bunk and McNulty or Treme’s Creighton Bernette might be fun to watch, but would you actually want to know them in real life? Anyway, I can’t help but wonder what Skyler turns into from here on. Her transformation, or emergence, is potentially the most interesting in the whole interesting series. Once again I find myself agreeing with you violently on one of my favourite TV shows. I find Bryan Cranston’s performance all the more shocking/amazing when I consider his performance in Mike in the Middle. I don’t know if you ever watched that show, or saw Cranston’s masterful performance on rollerskates in the most wicked blue lycra all-in-one, but to understand an actor can take me from the most ridiculously funny scene ever to many of the most disturbing suburban dystopias realised on screen is quite fabulous. The writing on Breaking Bad is so tight, the filming so beautiful and the disintegration of an ‘ordinary’ family so startling I can’t believe more of my writer friends don’t watch it. Never mind, I’m happy to have it (almost) to myself. In answer to your question: no, I wouldn’t want to know/work with Bunk or McNulty but they sure did make me despair/laugh in equal parts. Maybe we need these Type A characters to elicit that all-important emotional response. Great piece, you’re spot on. I was only recently thinking about how well they use light and scenery. Walt is nothing if not the ultimate train wreck, and that is why we (anyone with a sense for quality) cannot look away.